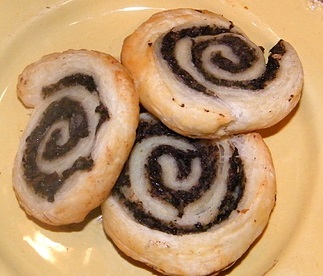 Mushroom Palmiers - Vegans Eat What? Vegans Eat What? These Palmiers are elegant, delicious and a fantastic appetizer to keep in the freezer for unexpected guests! In food processor, finely chop the mushrooms. Transfer them to a plate and set aside. Add the onion to a food processor and finely chop. In a large skillet, melt the Earth Balance over medium heat. Add the mushrooms and onion and cook, stirring occasionally for about 8 minutes or until the juices evaporate. Add the flour, lemon juice, thyme, and tabasco (if using). Season with salt and pepper to taste. Reduce heat to low and cook another 2 minutes. Place 1 pastry sheet on a flat surface. Unfold then spread ½ of the mushroom/onion mixture over the sheet. For a pretty design, roll up the pastry sheet from both ends, meeting in the center and then gently pressing together. You can also just roll the entire thing from one side, which is easier in my opinion. Repeat with the remaining pastry sheet. Tightly wrap each roll in plastic wrap and place them in a freezer bag. Freeze the Palmiers for 1 hour. At this point, you can leave the Palmiers in the freezer or partially thaw and bake them. When you are ready to enjoy the Palmiers, remove one or both from the freezer and let them partially thaw. Meanwhile, pre-heat the oven to 400 degrees. When the Palmiers are partially thawed, slice them into ¼-inch thick slices, using a serrated knife. Place (cut side down if you rolled them from both ends) on an ungreased baking sheet, 1 inch apart. Brush soymilk over the tops of the Palmiers if you prefer a glossy finish. Bake 18-20 minutes and serve hot. This recipe makes about 3 dozen from two sheets, depending on how thinly you slice the Palmiers. The recipe is adapted from one by Susan LeTerneau.